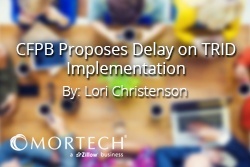 The Consumer Financial Protection Bureau (CFPB) has announced a proposed delay in the implementation date of TRID and the Know Before You Owe rule, moving the effective date to October 1, 2015. According to a statement by Director Richard Cordray, “we made this decision to correct an administrative error that we just discovered in meeting the requirements under federal law, which would have delayed the effective date of the rule by two weeks. We further believe that the additional time included in the proposed effective date would better accommodate the interest of the man consumers and providers whose families will be busy with the transition to the new school year at that time.” The proposal will be open for comment with a final decision to immediately follow. The question seems to be, what was this “administrative error”? An article in National Mortgage News seems to shed some light on this, attributing the delay to the Congressional Review Act (CRA). Under CRA, Congress and the Government Accountability Office are allowed to review “major” rules 60 calendar days prior to the rule taking effect. The CFPB submitted the rule 2 weeks late. After the push by Congress and mortgage trade groups for a delay, this is welcome news. The rule has caused waves within the industry for its changes, not only to disclosures, but to the entire real estate transaction process. Limited time for testing has had the mortgage industry on edge. Only time will tell if these extra 2 months will ensure everyone is ready for the changes. We look at industry happenings and updates every week. Check out last week's post, in which we look into the vague grace period for TRID granted by the CFPB.